The 2011 Napa Valley growing season was one marked by very cool temperatures which led to our latest harvest to date here at Kelleher Family Vineyard. We picked on November 2nd , 2011 in the early morning hours, finishing just before the skies opened up and brought inches of rain. We have found that this vintage has provided us with a flavor profile that developed at a lower Brix which has enabled us to make a truly elegant wine with softer tannin structure. Our estate grown 2011 Kelleher “Brix Vineyard” Cabernet Sauvignon has a deep dark ruby color with bright fruit forward aromas of Bing cherry, spice chocolate and coffee. The tannins are smooth yet firm, which makes this wine wonderful to enjoy now but know that it, will age and mature beautifully. The wine is balanced yet concentrated with a smooth richness on the palate. 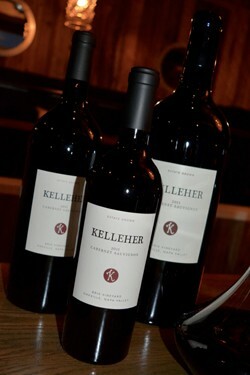 Tasting Notes Our 2011 Kelleher "Brix Vineyard" Cabernet Sauvignon is the most approachable vintage we have offered on release. Aromas of crushed violets and crème de cassis mingle with roasted espresso and shaved dark chocolate. The palate adds sweet Bing cherry fruit with complex layers of cola, star anise, clove and porcini powder. The richly textured, creamy mouthfeel leads to soft, ripe tannins on the long finish. It is enjoyable now but it will continue to improve over the next several years in bottle. Vineyard Notes All fruit is from our estate vineyard in the Oakville Appellation in the Napa Valley. Food Pairing Notes This big bold Cabernet Sauvignon will stand up well with Ribeye, Blue Cheese, and Filet Mignon.